Takeda Shingen is the daimyo of Kai province in central Japan and one of the greatest warriors of the Sengoku period. This book tells his story as seen through the eyes of Kansuke Yamamoto, one of Shingen’s 24 generals. The crippled, disfigured Kansuke is an excellent swordsman and a brilliant strategist, and his shrewd ideas win many a battle for his master. Not only the men are scheming in this period though, the women are their equals, and sometimes even their betters. Princess Yuu, who wanted to kill herself upon her father’s defeat, becomes Shingen’s concubine, and, through a number of open and hidden plots, she secures the succession of her son as Shingen’s heir. In the end, Kansuke dies in the battle of Kawanajima in what would turn out to be his greatest victory. Shingen himself however, is ultimately killed by the armies supporting Oda Nobunaga, one of the major players of unification of Japan. Takeda Harunobu, 1521 – 1573, later named Shingen, was one of the strongest warriors in the Sengoku period, a time of uproar and fighting throughout Japan. The shogunate was very weak at that time, and the hierarchical order broke down, so that anyone who had the power and ability could aspire to lead and rise through the ranks. The banner Shingen carried in his campaigns bore the four characters fu-rin-ka-zan from Sun Tsu’s “The Art of War”, which can be translated as: Be as swift as the wind, as silent as the wood, attack as fiercely as fire, be as composed as the mountain. 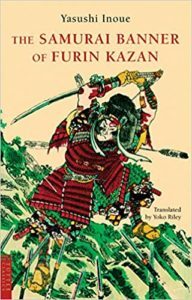 The book starts shortly before Yamamoto Kansuke entered Shingen’s services and ends with his death on the battlefield. The main focus lies on the battles that Shingen fought with Kansuke’s help, but we also get some insight into the daily lives of the people of this period. Interesting to see is how Shingen keeps acquiring women as concubines for his pleasure – very much to the dismay of Kansuke, who is very devoted to Princess Yuu, maybe even more so than to Shingen. Yasushi Inoue (1907 – 1991) was known as the master of historical fiction in Japan. Before becoming an author, he worked as a journalist, and already his first novel Togyu (A Bullfight) received the renowned Akutagawa prize. If you’re interested in historical fiction, this book is for you – of course available on amazon.